Body & fundus act as a reservoir for food. Antrum acts as a mill, mix & grind the food & expel it to the duodenum. 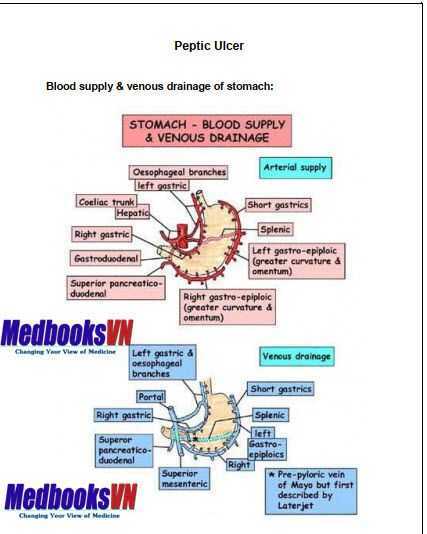 Gastric motility is controlled by intrinsic neural plexus which are regulated by the extrinsic nerve supply (vagus) Truncal vagotomy affects & reduces gastric motility. Also, sympathetic n. inhibit gastric motility. epith. against acid and pepsin. specific receptor for each of the 3 stimulants. Gastrin & Ach release histamine from mucosal stares. Ach stimulate secretion by inhibit the release of somatostatin. In truncal vagotomy not only Ach stimulation is affected, but also gastrin & histamine efficacy is reduced. stimulate gastrin release from antral mucosa. a. Hyper secretion of acid and pepsin. (D.U) b. Defect in mucosal defense. (G.U) c. H.pylori infection.  Occur after major surgery, trauma or sever illness.  Multiple small superficial ulcers in the stomach or duodenum.  In patient with sever burns.  In the duodenum.  In patient with neuro-surgical illness or head injury.  In both stomach or duodenum. o The 1 st part of the duodenum is the commonest. o If it is in the Ant. surfac e → perforation. o If it is in the Post. surface → He by erosion of arteries. o Type 1 (1ry GU): often in the lesser curvature. o Type 2: same as type 1 plus a D.U. o Type 3: in pyloric channel or prepyloric area. o At the lower end. o Due to reflux of acid and pepsin from the stomach. o Zollinger-Ellison syndrome. o After gastro-jejunostomy. o Due to the presence of ectopic gastric mucosa.  May be without apparent cause.